Charles Guiteau, “Charles Guiteau,” Histories of the National Mall, accessed April 23, 2019, http://mallhistory.org/items/show/410. Charles Guiteau shot President Garfield on July 2, 1881 at the Baltimore and Potomac Railroad Station on the National Mall. 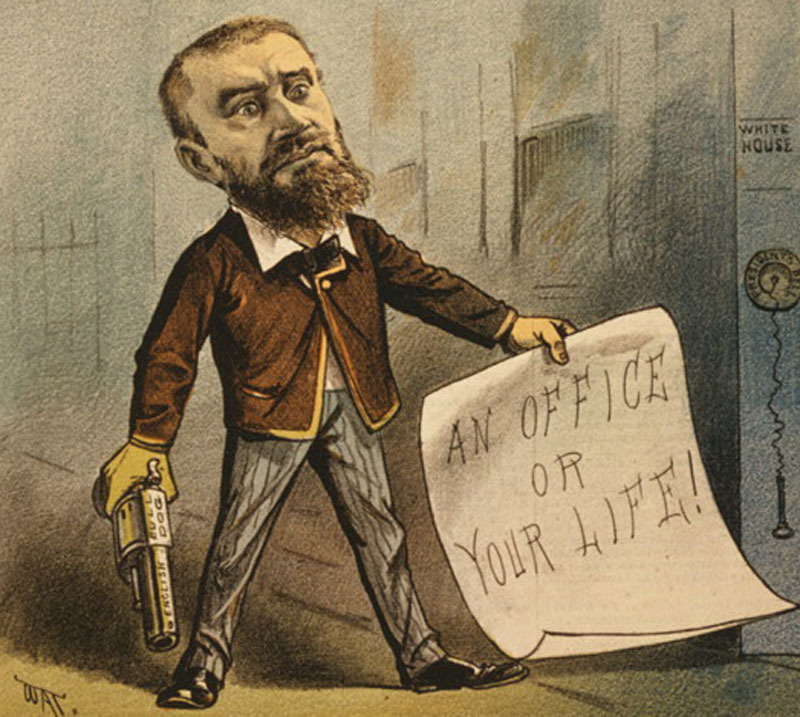 Guiteau shot Garfield because he had been denied a political appointment that he believed he deserved. Garfield eventually died from complications from the gunshot wound. Guiteau was tried, found guilty, and sentenced to death by hanging on June 30, 1882 at the District of Columbia jail. Guiteau led an unsettled life. Beginning in his 20s, he joined the Oneida Community, a controversial religious sect, but then left it. Then, he unsuccessfully attempted careers in law, theology, and politics. He married in 1871, only to be sued for divorce two years later when his wife could no longer put up with his violent temper and infidelity. In the 1880s, Guiteau turned his focus to politics. Initially a partisan of Ulysses Grant in the Republican Party nominating split of 1880, Guiteau eventually shifted his support to the comprimise candidate, James A. Garfield. With Garfield as the Republican nominee, Guiteau replaced Grant's name with Garfield's in the supporting speeches he had written and began offering to campaing on the candidates behalf. Although, the Garfield campaign mostly rebuffed Guiteau's offers, he envisioned himself substantially responsible for the Republican's victory. As a result of his contributions, Guiteau was convinced that he deserved a diplomatic appointment. He daily harassed Garfield and his cabinet members for a job, until finally Secretary of State James G. Blaine told him to never return. Upon this affront, Guiteau began planning Garfield's assassination. On the morning July 2, 1881, Guiteau met President Garfield and Secretary Blaine at the Baltimore and Potomac Railroad Station, where he fired two shots at the President. The first shot just grazed the President, but the second would ultimately lead to his death in September. Guiteau was tried and convicted for murder, and was hanged on June 30, 1882. Douglas O. Linder, "The Trial of Charles Guiteau: An Account," Famous Trials, 2007.